It’s week one of 2015, which generally brings high hopes when it comes to improving your health and wellness. Worldwide, millions upon millions join gyms, swear off soda and processed foods, and commit to making this the year they turn things around. But by February, many have already abandoned their goals, and with each passing month, more follow. Move beyond the moment: Step 1 is getting beyond the “time to turn my life around this year” moment and dedicating yourself to the effort it takes to complete any resolution. After all, it wouldn’t be on your list year after year if it were easy, right? This is a 365-day process that will have its ups and downs (see step 2), and the quicker you realize that – and still believe you can succeed – the better. Master the selfie: Whether it’s done with your cellphone or mental snapshots, become a master of the selfie, tracking the person you were and the person you’re becoming, day by day. If it’s weight loss you’re after, snap a photo every time you see a difference. Looking to stress less? Take plenty of selfies of you enjoying life more – while on that vacation you vowed to finally take, spending a lazy spring day with your family (that never would have happened in 2014, 2013, etc. ), or just relaxing in your own backyard on a much-needed day off. Write your 2016 resolutions now: Want to maximize the chances you’ll polish off your 2015 resolutions? 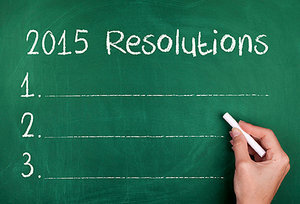 Write your 2016 resolutions today – and don’t mention any of your 2015 resolutions. After all, why write down resolutions that won’t be needed anymore? In fact, go one step further by crafting 2016 resolutions based on the person you’ll be after completing your 2015 resolutions. If you’re losing weight in 2015, resolve to take a vacation to a beach destination in 2016 – and wear that bathing suit you know you’ll fit into by then. Trying to eat better in 2015? Then put “Make more healthy meals from scratch” on your 2016 list, after you’ve learned how to eat right this year. Resolutions can motivate and empower, or they can just remind you of what you couldn’t accomplish year after year. In 2015, rely on the past, the present and the future to ensure 2015 – and the year after that, and the year after that – gives you a great big reason to smile.